OPTION-1: Dongle plugged into Windows Computer. OPTION-2: Dongle plugged into Raspberry Pi. Install dvb-t rtl driver zadig if not yet done so, as detailed below. (2) Plug the DVB-T or ProStick in your Windows Computer. 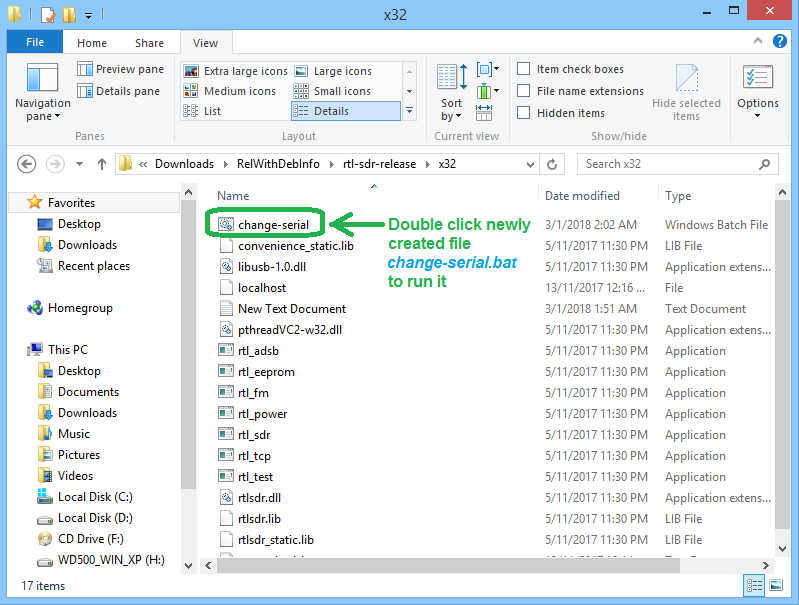 (a) Double click Zadig 2.3.exe to run it. (b) On main menu, click "Options". On the drop-down, place a check mark beside "List All Devices". (c) From list of devices, select "RTL2838" which is actually DVB-T/ProStick. Now click button which will either say "Install Driver" or "Reinstall Driver"
(a) First EXIT your Flightradar24 feeder, or dump1090, or RTL1090 or ModeSdeco2 or any other software which is using DVB-T to make the Dongle free for test. (b) Un-zip RelWithDebInfo.zip. 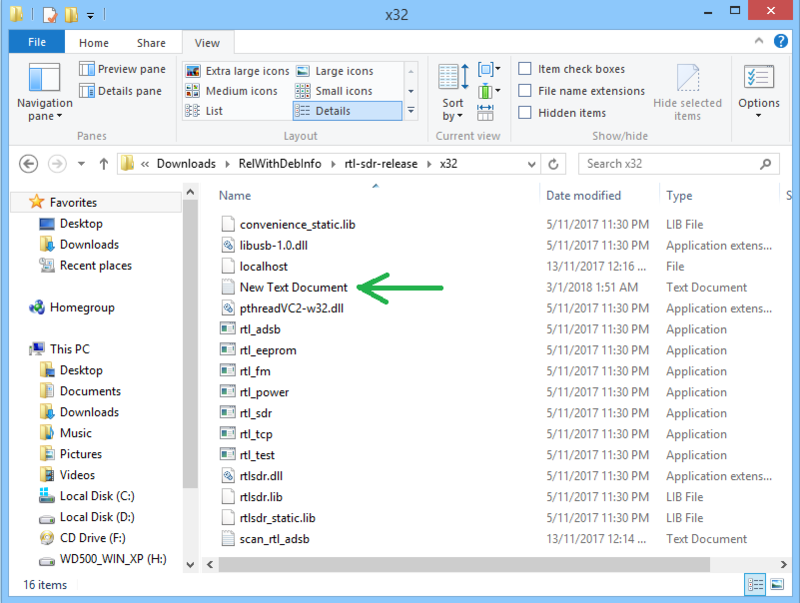 It will create a folder RelWithDebInfo. 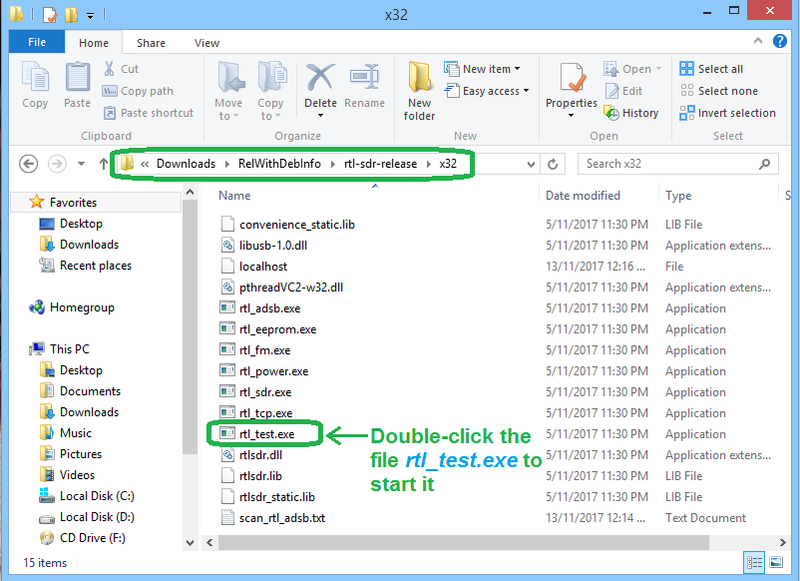 Inside this folder there is another folder rtl-sdr-release which contains several files and 2 folders named x32 and x64. (c) Go to folder x32. You will find many rtl tools in it as shown in screenshot-1. (d) Double-click file rtl_test.exe to run it. 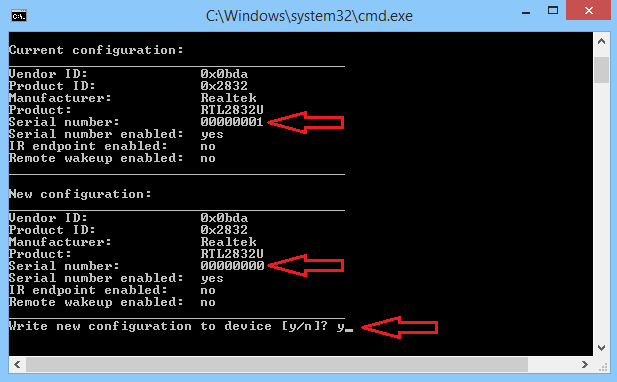 A command console will open and if Dongle is OK, it will give output as shown in screenshot -2. 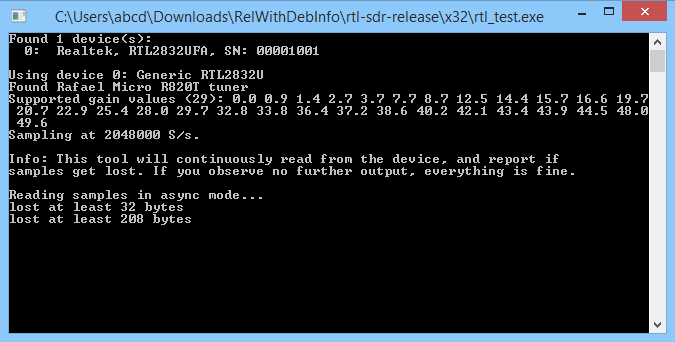 NOTE: If you have a PI24 image, the above commands sometimes fail to install rtl-sdr due to "read-only file system". In this case, issue following command to make the system "read and write", and after this, again run above commands to install rtl-sdr. #depending on which version of dump1090 you have installed. Reboot your Raspberry Pi to restart dump1090 and all data feeders, and restore to normal operation state. Last edited by abcd567; 2019-04-10 at 17:36. First stop the dump1090 to make Dongle free for use by rtl tools. Install package rtl-sdr, if not yet done. The last line of output will ask confirmation to go ahead with change. Please replug the device for changes to take effect. 2. 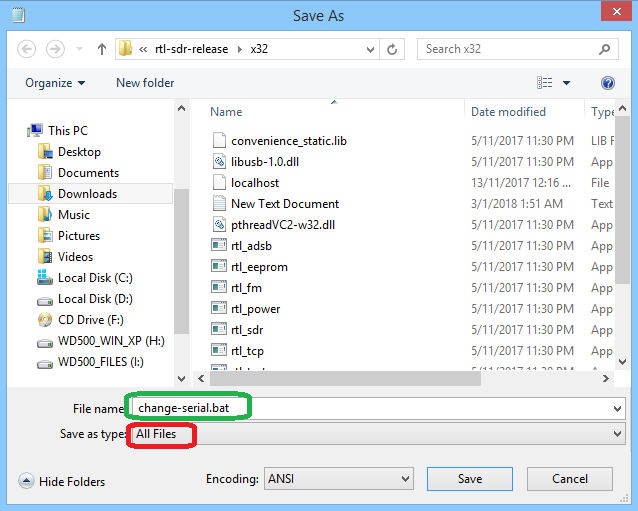 "Save as type" is selected "All Files"
Upon double clicking the file change-serial.bat, command console will open, with last line asking confirmation to change serial number. 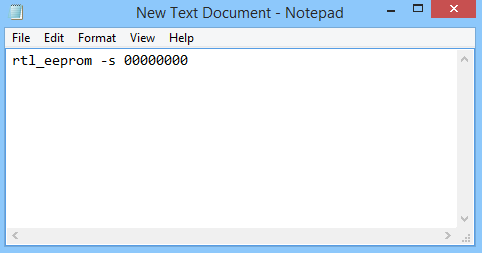 Type y and press Enter key. The serial number will change and command console will close immediately. To check if the number has actually changed, again double click the file change-serial.bat, and it will show changed serial number. 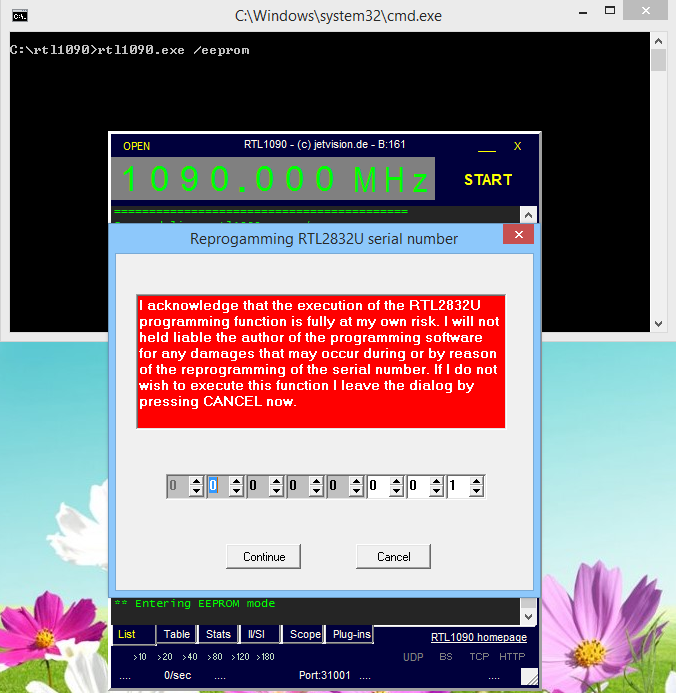 Step-2: Click START button on RTL1090 window. Step-3: Set serial number and press Continue button. Last edited by abcd567; 2018-04-15 at 06:52. This error comes when rtl_test command is given while dump1090 is running. Thanks - I did try a repost earlier but doesnt seem to have been approved (or declined) by mods. Sun Apr 22 18:08:23 2018 BST dump1090-mutability v1.15~dev starting up. Sun Apr 22 18:08:29 2018 BST Warning: lost the connection to the RTLSDR device. Sun Apr 22 18:08:34 2018 BST Trying to reconnect to the RTLSDR device.. I am using a Rpi Model B, I have changed to a different 2.1a 5v PSU with the same issue and tried a different fresh SD card, I purchased my DVBT off ebay and the seller is kindly shipping another for me to try in case it is faulty. To answer Damianiw - @ signs and some code triggers anti-spam under a threshold.